Consistent volcanic activity from Mt. Kīlauea has frequently hung a black cloud over the idyllic Hawaii Island, Hawaii. While residents have become accustomed to the frequent spells of air pollution, there was little qualification of the smog and understanding of the associated health implications - that is, until residents took matters into their own hands, measuring air quality with locally deployed AirVisual Pro monitors. Latest air quality data for 2018 reveals that the majority of the world breathes unsafe air, far exceeding WHO air quality guidelines - while also highlighting an unequal distribution of PM2.5 pollution and availability of monitoring stations. Igor Shpeht unites a community of concerned residents in Krasnoyarsk by creating a local platform to access air quality data and advisories - previously unknown. Equipped with data from publicly contributed AirVisual Pros and a growing community of aware citizens, he hopes to fight government complacency on the issue. Increased population density causes urban buildings to be more likely to suffer dirty air, with elevated levels of PM2.5, formaldehyde and asbestos - all of which can threaten your health and wellbeing. Awareness to the dangers and sources of these harmful pollutants, and knowledge of how to avoid them, will help to ensure a healthier, happier you while living in or visiting cities everywhere. Increased outdoor activity and heat-induced air pollution in the Summer can make for heightened health risks. Learn which invisible pollutants are at play this season, and how to reduce your risk of exposure. IQAir AirVisual's crowdsourced monitoring network has achieved some incredible victories in exposing air pollution in new communities around the world. In the past year, citizen air monitoring networks expanded hugely across different regions, from Kabul to Kuwait, Côte d’Ivoire to Qatar, and beyond. But the journey isn’t over yet! See how you can get involved by adding your community to the map. Nearly 40 years have passed since asbestos was identified as a lethal contaminant, yet historic widespread use of the mineral continues to haunt millions today, particularly from occupational exposure. AirVisual highlights the industries most affected, and what can be done to safeguard against the deadly toxin. Abid Omar, long-time Beijing resident originally from Pakistan, is making waves with his outdoor citizen network of AirVisual air monitors. 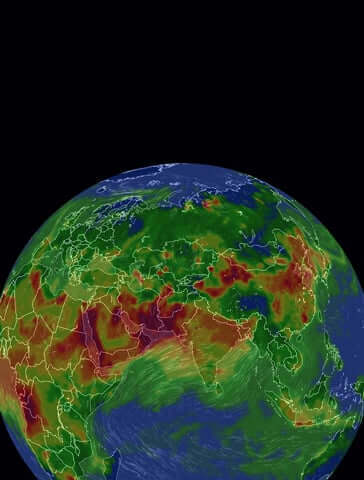 He tells us his reasons behind revealing his home country’s air quality, and the explosive impact his data is having on the country's response to the pollution problem. PM2.5 particles are well-known to harm human health. But what else can happen when you breathe them in? Recent research in Shanghai reveals some unknown interactions of PM2.5 with the human metabolism. How can I make a difference reducing air pollution? Here’s 10 ways! There are countless ways to reduce your emissions footprint. Here are our top 10 tips to inspire you to make changes in your daily life. For the very first time, air quality data from Nigeria is reported in real-time and broadcast live to the world. Rafael, the proactive citizen behind the installation, explains what he sought to achieve by implementing his Node as a public outdoor monitoring station. Engaged parent and Singapore resident Leslie tells us about her motivations to install a Node as a public outdoor station. We start in Mexico, where clean air enthusiast Raul has implemented a network of six Node air monitoring stations spanning Monterrey to Mexico City in an effort to increase local air quality awareness. In less than a year, the AirVisual Node has been deployed as a public outdoor air monitoring station in more than 20 countries, for some of which Nodes are the only data source. Citizens have chosen to take their local air quality into their own hands around the globe - discover where and why!